Availability: November and December. February through June. Source: California, Central and South America. Applications: Ripening cherimoya is basically pretty simple. It is just kept at room temperature on the kitchen counter, and it will be ripe and ready to eat about seven days after it was picked. Cherimoya is ready to eat when it softens to about like the heel of one's hand. If in doubt, it should be allowed to ripen further. It's better for it to be a little over ripe than a little under ripe. After ripening, cherimoya can be kept for several days in the refrigerator. It should not be put in the refrigerator before ripe. History: The cherimoya is believed indigenous to the interandean valleys of Ecuador, Colombia and Bolivia. In Bolivia, it flourishes best around Mizque and Ayopaya, in the Department of Cochabamba, and around Luribay, Sapahaqui and Rio Abajo in the Department of La Paz. Its cultivation must have spread in ancient times to Chile and Brazil for it has become naturalized in highlands throughout these countries. 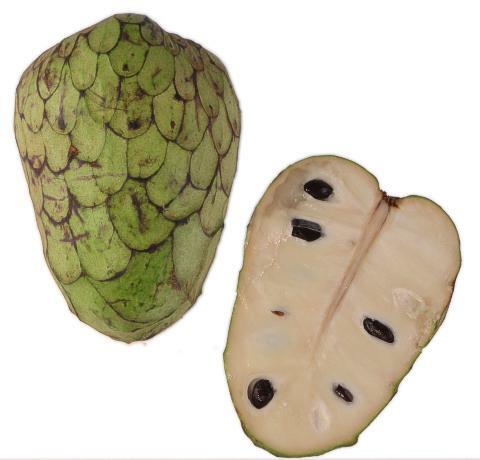 Many authors include Peru as a center of origin but others assert that the fruit was unknown in Peru until after seeds were sent by P. Bernabe Cobo from Guatemala in 1629 and that thirteen years after this introduction the cherimoya was observed in cultivation and sold in the markets of Lima. The often-cited representations of the cherimoya on ancient Peruvian pottery are actually images of the soursop, A. muricata L. Cobo sent seeds to Mexico also in 1629. There it thrives between 4,000 and 5,000 ft (1312-1640 m) elevations.